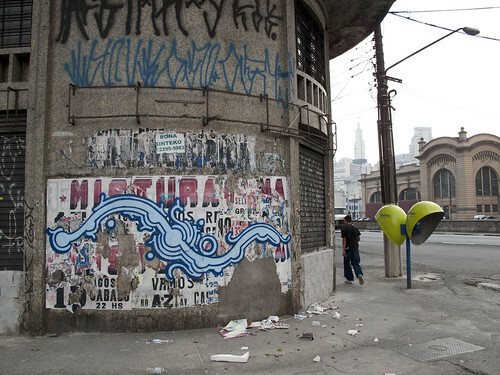 Zezão, is a street-artist from Brazil, whose work reacts to, frames, and draws its aesthetic from São Paulo's chaotic urban landscape, which is sloppy with its public space, with its rivers and its trash. Embodying skate and punk culture, he creates interventions within the cockroach and rat infested infrastructural bowels of the city, using graffiti, video and photography to produce site specific installations in sewers, under derelict transport structures, and in precarious storm-water drainage channels. Zezão has participated in solo and group exhibitions worldwide, including at the MASP- Museum of Modern Art in São Paulo, at the Scion Gallery in Los Angeles, at the Une Festivalle in the LJ Gallery in Paris as well as at the Namefest World of Graffiti event in Prague. Tonight in London at the Architectural Association School of Architecture from 6pm a workshop and lecture by Zezão, on city works, hosted and introduced by Franklin Lee.